The charming downtown district of Douglas has a new kid in town. Laura Jean, a beautifully designed 1800 sq. foot boutique located at 35 Center Street, is now the newest member of Douglas' retail community. Tammy Kerr, owner of Harbor Shores Realtors, launched her latest venture with a grand opening on March 9 that met with unanimous approval. 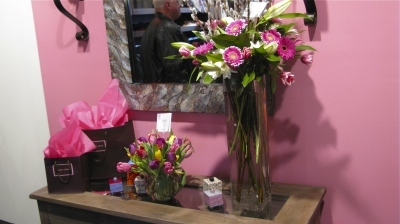 Tammy has dedicated the store to her good friend Laura Jean Stannis, who passed away from breast cancer last summer. To further honor her friend, part of all boutique profits will be given to the American Cancer Society and/or the Breast Cancer Research Foundation. 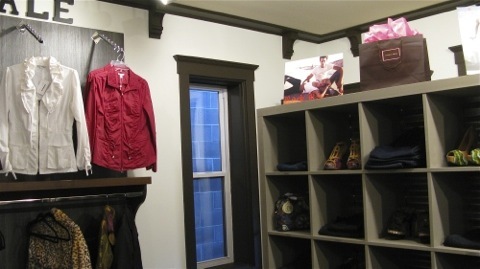 Walk through the door, and you will be struck by a retail space that feels both hip and French. 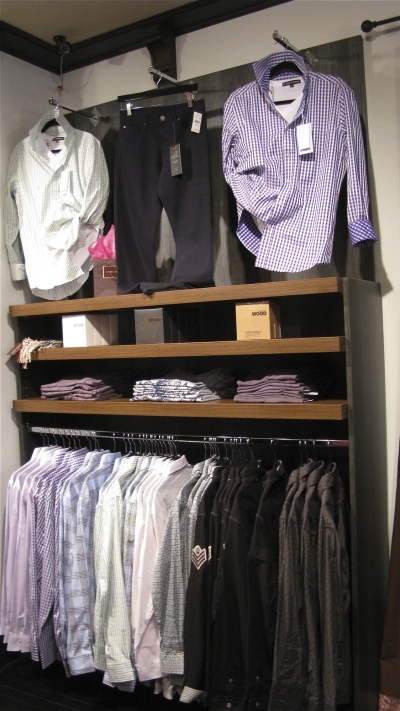 Next you will be impressed by the wide array of scarves, belts, cards, clothing and shoes. 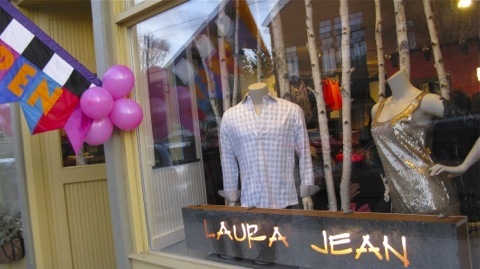 One side of Laura Jean is dedicated to men's apparel, including shirts, jackets, pants and bathing suits. 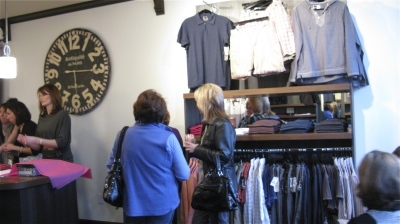 The other side offers an eclectic mix of women's clothing and accessories, ranging in style from edgy to conservative, but always fashionable. . Looking for a hard to find size? Whether small or large, owner Kerr has tried to accommodate you. 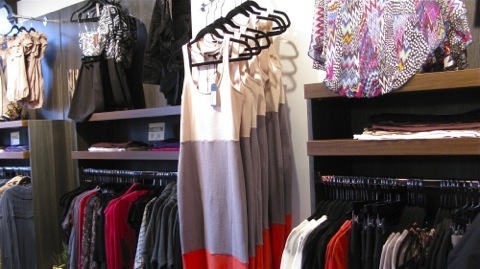 And along with a variety of styles and sizes, Laura Jean's prices range from average to high end. Owner Tammy Kerr with the Laura Jean staff, many of whom are literally family...but all of whom are friends. 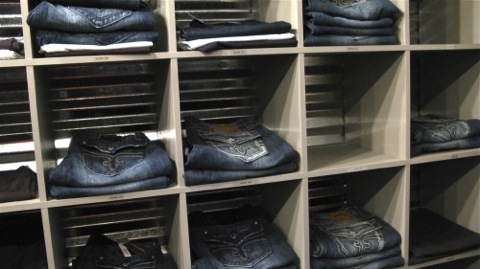 The boutique carries a fantastic selection of jeans for both men and women. Check out the back of the store for sales items and the latest in footware. And whether you need a break from shopping or your significant other would like to rest while you browse, Laura Jean offers visitors a lovely place to relax. 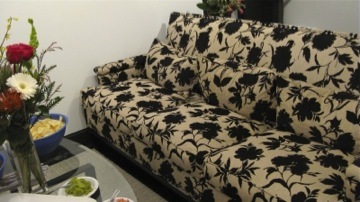 So reach for a glass of chilled wine, settle back on one of the comfortable couches and take a breather. 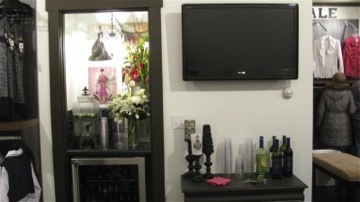 There's even a flat screen TV if anyone is worried about missing the big game or a favorite TV show. 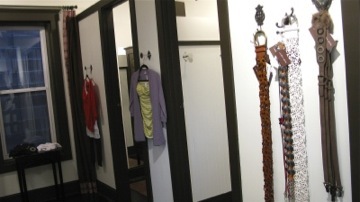 Btw, the dressing rooms are as stylish and spacious as the rest of the store. 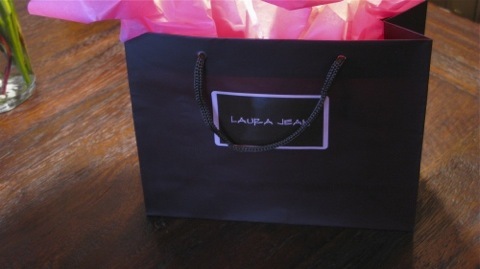 Without question, Laura Jean is a fitting tribute to its namesake, a woman who loved shopping and fashion. The next time you're in downtown Douglas, make certain to visit Laura Jean. You'll be sure to leave with at least one black and pink shopping bag. Thursday, Friday and Saturday, the store will remain open till 10 or 11pm.